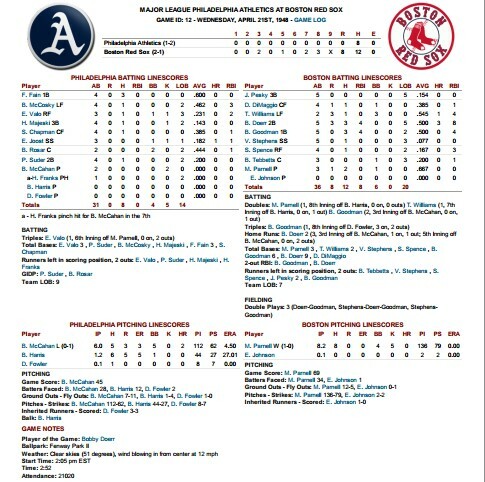 Stan Spence was just a double short of the cycle as the Red Sox beat the Yankees 7-2 in the first game of a three game series at Yankee Stadium. 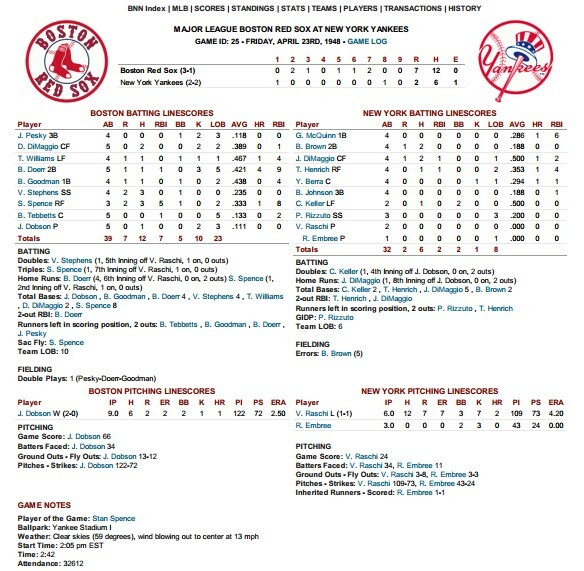 The Yankees were unable to retire Spence as he went 3-3 with a homer and a walk and drove in five runs. 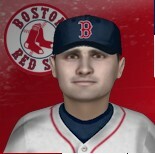 Spence now has 8 RBI on the season which is second on the team to the red hot Bobby Doerr who homered again on Friday. Doerr now has four homers in as many games. Joe Dobson went the distance for the Red Sox and is now 2-0 on the young season. The highlight for the Yankees was the monster homer by Joe DiMaggio to dead center-field. Estimates have the homer traveling 535 feet. It was DiMaggio’s first homer of the season. Bobby Doerr homered twice and drove in four runs as the Red Sox took down the Athletics 8-0 in the rubber game of the three game series. 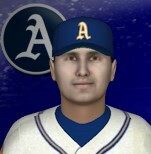 Mel Parnell shut down the A’s for 8 and 2/3 innings. Earl Johnson came in for the final out. “I wanted to stay in there to get the shutout but I was starting to tire and and Joe saw it and took me out. It is a long season and the most important thing is we had the game in hand” said Parnell. Doerr now has three homers on the season and has driven in eight runs just three games into the season. The Red Sox get a another day off tomorrow and then will open a three game weekend series Friday in New York against the Yankees. Ted Williams got the Red Sox off to a winning start for the 1948 season with a three hit day which included a home run and four runs batted in. The Athletics were up 1-0 in the Top of the 4th and threatening when pitcher Lou Brissie attempted to help his own cause with a single to centerfield. Eddie Joost was waved home but was thrown out by Dom Dimaggio to end the inning. 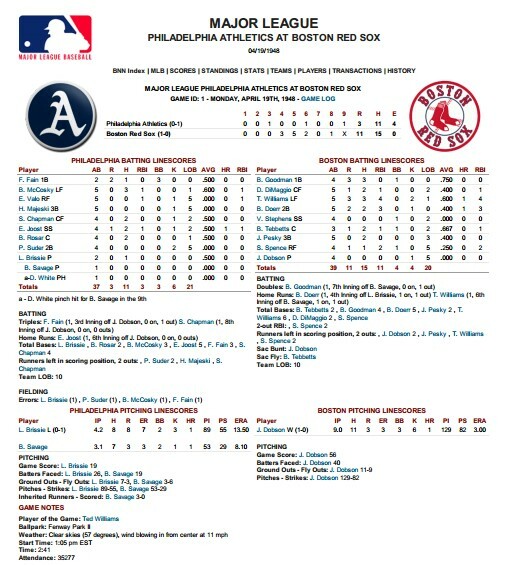 The momentum appeared to change on that play as the Red Sox would jump on the A’s and Brissie in the bottom of that inning with three runs highlighted by a tw0 run homer by Bobby Doerr. The Sox would add five runs in the fifth inning and two more in the sixth and cruise their way to a season opening win 11-3. 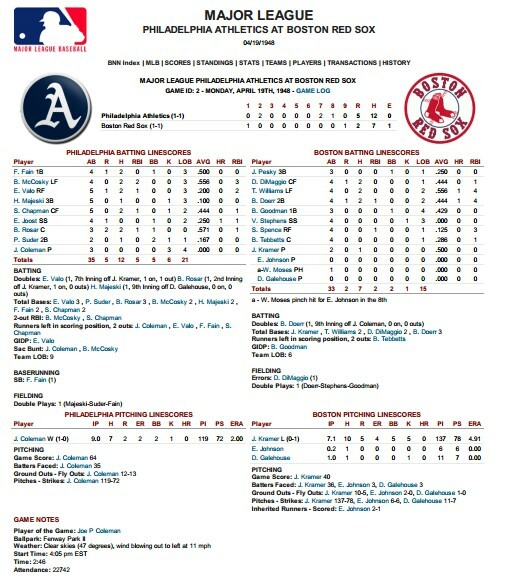 Joe Coleman shut down the Red Sox in Game 2 of the opening day doubleheader as the Philadelphia Athletics defeated the Red Sox 5-2. The teams will have take a day off on Tuesday and will conclude the three game series on Wednesday from Fenway Park. We are just two weeks away from the start of the 1948 season and the media predictions are rolling in. The Cleveland Indians and the New York Giants are favored to meet in the World Series. The writers also predicted that Ted Williams and Stan Musial would win the MVP of their respective leagues. The Red Sox were picked to finish third in the American League behind the Indians and Yankees. The Red Sox will open up the season at home with a doubleheader against the Philadelphia Athletics.